Interstate 90 crossing the Columbia River at Vantage Bridge. "People say that they 'love' the desert, but few of them love it enough to live there. ... Most people 'love' the desert by driving through it in air-conditioned cars, 'experiencing' its grandeur. That may be some kind of experience, but it is living in a fool's paradise." There's a kind of ritual we in the Northwest go through whenever describing our fair region to those at the far reaches of this country. "You're from Washington? How do you handle all the rain? Do you have mountains everywhere?" "Actually, most of Washington is dry. After you cross the Cascades, it's, well, a lot different than Seattle." Even our cross-state brethren seem amazed that we can muster the intestinal and moral fortitude to live here on "the dry side." But let's be honest: Inland Northwest folks — as in Spokane and North Idaho — can be just as dismissive of the central part of the state. How many times have you referred to the Tri-Cities as "Dry Shitties"? Or Moses Lake as "Moses Hole"? That's unfortunate. While a little friendly intrastate rivalry between regions is understandable, that kind of thinking blinds us to the reality that we live in one of the most ecologically, climatically and geologically diverse areas of the country. In no other place can you drive from ocean, across rainforest, over coastal mountains, to a lowland sound, cross another mountain range, descend into the foothills, cross a major river, see high and arid desert landscapes and long, grandiose basalt plateaus, and again climb into the forested green foothills of another mountain range — all in a day. In the same state. Indeed, the drive between Seattle and Spokane is a long one, but it's much more than a Northwest version of "flyover country" — or drive-by country. That heart of the 509 between Ellensburg and Ritzville is as much a part of our striking region as the towering majesty of Mt. Rainier viewed from a Puget Sound ferry, or the solemn wonder of being deep on a trail in the Selkirks. 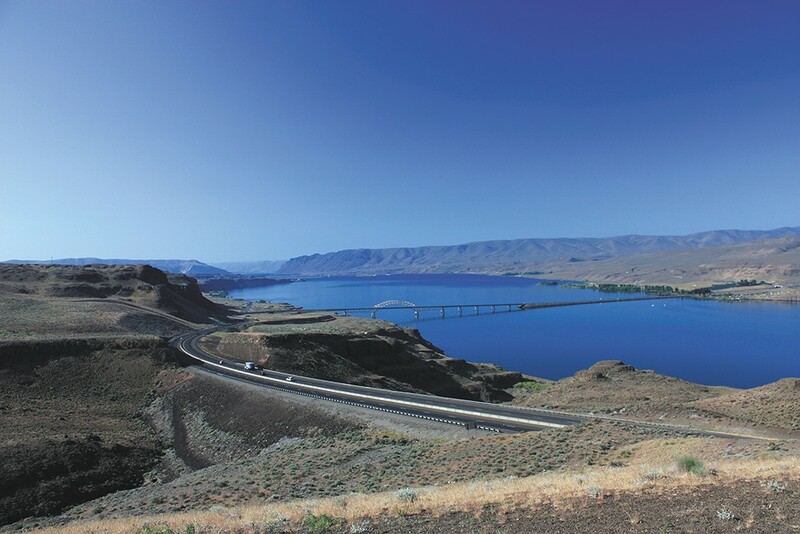 For it's in the desert of Central Washington that you'll find the connectivity of landscapes and resources that bind this region together from west to east. Poor middle child. So overlooked — and seemingly unappreciated. When someone asks my favorite sight or place in the Northwest, they're usually surprised by the answer. Not just friends from far across the country, either. Those in the Spokane area and those on the "wet/west side" seem equally surprised that among my favorite spots to visit, there is no high peak to gaze upon nor ocean sunset to admire. It's not the snow-capped splendor of Cascade volcanoes or the almost surreal swirl of tidal waters from Haystack Rock on the northern Oregon coast. But it's something I love to see whenever I get a chance to drive between Seattle and Spokane near sunset. Here on the east side of the Vantage Bridge, with the Columbia River below, is the Wild Horses Monument. Easy to see from east or west directions on I-90. Have you ever stopped and walked the short (and steep) loose dirt trail to see them from this side? If you do, you'll look out to the west, across the mighty Columbia, that source of water, power and culture that binds all sides — east/west, north/south — of the Pacific Northwest. Here in the desert of Central and Eastern Washington, this dry, agricultural, largest potato-producing county in the nation (sorry, Idaho), is this monument. People may stop here on a cross-state trip, or as a quick pit stop before the annual Dave Matthews pilgrimage at the Gorge Amphitheatre a few miles up the road. Or they may never stop. And that's a shame. Because when you drive by or fly over, you miss sights — you miss experiences — like this. The sun setting over the west, over the Saddle Mountains, beyond to the Cascades, melting the hot summer day into the cool desert air, framed by the wind turbines scattered through the rugged shrub-steppe sageland of Kittitas County that eventually yields to the hay fields on the valley floor below. Look out there to the west next time, across the horses. Look there through the desert, above the spinning turbines, toward the mountains, and you'll see what it is that makes Washington and the Northwest so desirable. So special. It's not one thing, one sight, one mountain, one type of climate, one vegetation zone, one volcano framed with the Space Needle in the foreground, perfect for a postcard. It's all of them, here, in one spot, one region. That's why we stay. That's why we live here. That's why this is home.